Mustard algae are a chlorine-resistant form of green algae that often resembles dirt or sand on bottom or sides of pool. These algae contain compounds that act as a defense mechanism against the oxidation efforts of sanitizers, helping it survive even in highly chlorinated conditions. 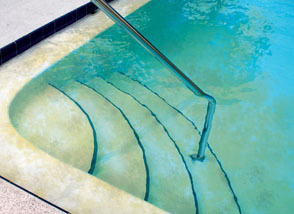 This factor can even create a large chlorine demand in certain situations. Mustard algae can be brushed away very easily, but returns quickly.